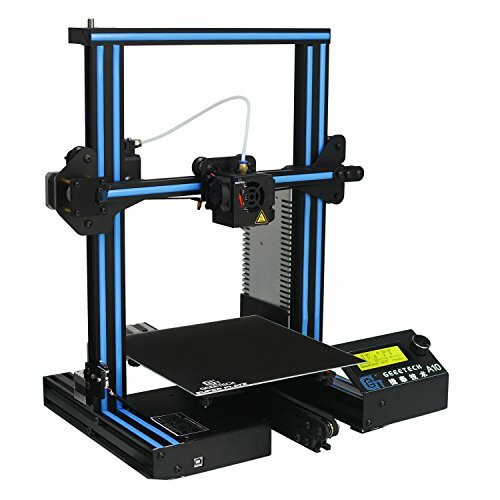 GEEETECH A10 3D Printer, Fast-Assembled Aluminum Profile DIY kit, with Open Source firmware, High Adhesion Building Platform, Stable Movements on V-Slot Rails, 220×220×260mm Printing Size. Filament: ABS / PLA /flexible PLA/wood-polymer/PVA/HIPS/PETG, etc. Fast assembly: Modulated structure allows it to be installed within 10 minutes. Simple and convenient. Open-sourced control board provides limitless possibilities to adjust your printers and modify firmware on your will. Featuring printing accuracy of 0.1 mm, A10 delivers fine prints with delicate texture, sleek contour and stable structure. High adhesion building platform allows you take down your printing works easier, do not need mask tape and glue stick any more. Quieter and more stable printing movement: The V-shaped wheels and V-slot rails on each axis make the printing quieter, more stable, and more wear-resistant.